You may remember that I helped Mustang Maniac out at their local car show at Enfield Pageant of Motoring 23 – 25 May this year. I was there with the usual loyal customers and good friends of MM. We all had a great time and spoke to lots of guests about the cars we bought along and all about repairs, parts and restorations. My car was there as an exhibit to show what it’s like to be part way through the nut and bolt restoration process. It turns out that “Classic American” magazine were also there covering the event and taking some pictures. It turns out that one of those pictures was of my car. My wife treated me to the annual subscription to the American Classic magazine as a birthday present a little while ago. The subscriber magazines arrive about a week ahead of officially hitting the shops. As usual I unwrapped the August edition of the magazine and assumed the position on the sofa. A habit of mine is that I just start flicking through the pages in order to work out what I was going to read first. I turned a number of the pages and when I got to page 70 I saw my car, in print. A full-page write up of the event and half of that page is a photo of my cherished car. I was so excited that the wife jumped out of her skin as I yelled out “Yes – my motor”. She wondered what the fuss was all about, she soon found out as I wedged the magazine right in front of her face as she was watching some TV. I think she got fed up with the fifth or sixth viewing of the article. 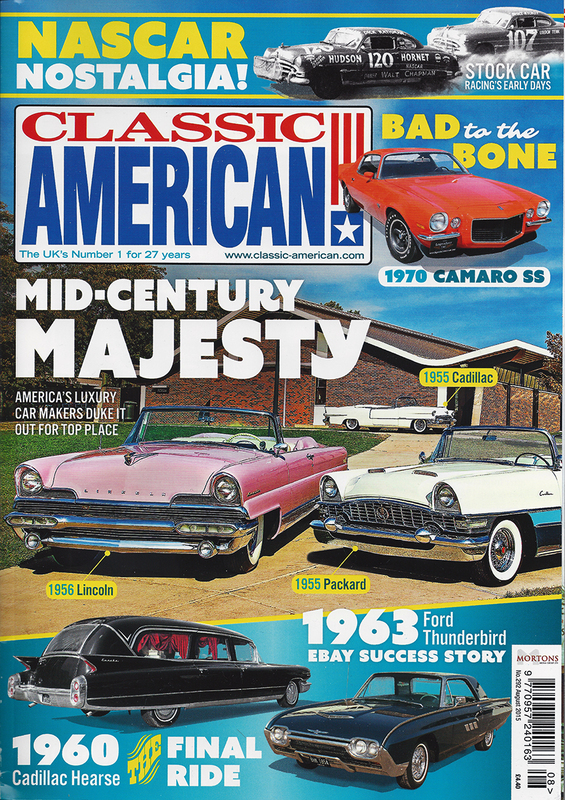 The Classic American August edition #292 is in the shops from July 16th 2015. Some pics again of the Enfield Pageant 21-23 May 2015 on the Mustang Maniac stand. Of course I can’t take credit for it all on my own, I have had help to get this far. So, it’s a big thanks to Adam and all the guys at Mustang Manic for getting me where I am today. Let’s hope there are more pictures to grace the pages of magazines in the future. It would be nice of course, but not to be expected or taken for granted. 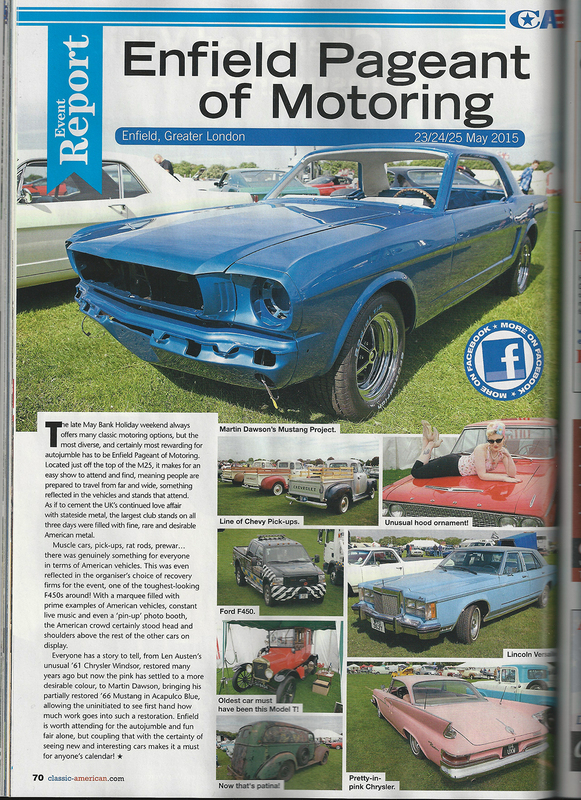 This entry was posted in Articles, Car, Photo's and tagged Classic American magazine, Enfield Pageant 2015, Mustang, Mustang Maniac, One man and his Mustang. Bookmark the permalink. How exciting for your!!! All that hard work paid off. That’s what I keep telling people, but the non petrol or gear heads just look at me strange. Lol. Way to go, Mart! She’s already famous. I’ll look for the magazine, who knows one day i’ll ask you for an autograph. Bravo!!! Wow! That’s almost as good as being on “The Cover of the ‘Rolling Stone'”! Or on “The Cover of the ‘Radio Times'” as you might have heard it in the UK.